Behind a giant banner simply reading “UNION!” poverty-wage airport workers, faith leaders and community members marched down Pacific Avenue towards Alaska Airlines Global HQ. Reverend John Helmiere of Valley and Mountain United Methodist Church, wearing the white collar of his faith, glanced over at the over-sized letter informing the airline that these workers have formed a union, and then knocked on the locked glass doors. 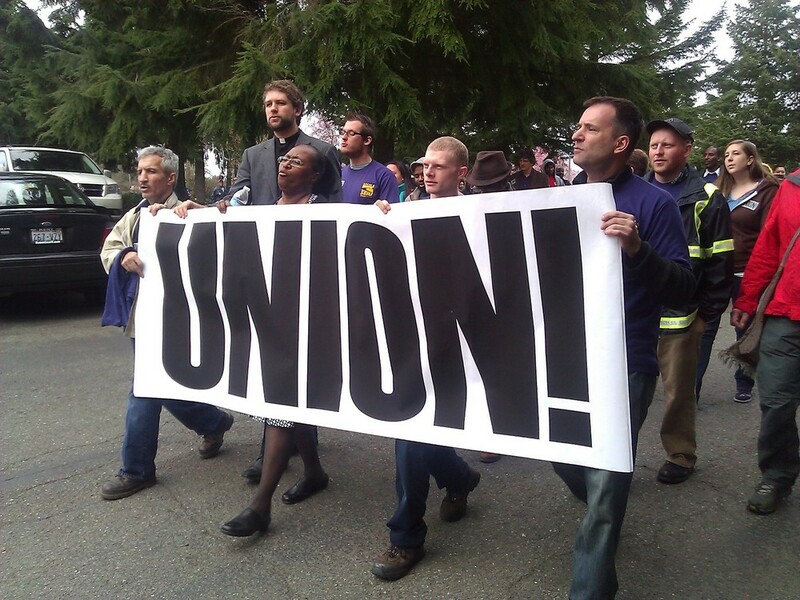 Thousands of workers at Sea-Tac Airport are paid poverty wages. These are the cabin cleaners, ramp workers, fuelers, skycaps and wheelchair agents. They serve the customers of Alaska and other major airlines with dignity and respect–something unreturned by their employers. Spencer a worker for Menzies, a poverty-wage contractor Alaska hires to handle its customers’ baggage, wiped his hands on his jeans, stood in front of the Alaska Airlines HQ sign and took the microphone from the TV reporter’s hand. We cheered as he paused searching for words. Alaska Airlines and other major airlines in Sea-Tac farm out thousands of jobs to contractor companies in a mutual race to the bottom in regards to wages, benefits and basic workplace respect. There have been numerous calls for change and these contractor companies, hired and retained by Alaska Airlines, have refused to make the basic changes needed to ensure safety, fair wages and decent benefits. Workers and community allies stopped by five contractor companies informing the bosses that they have formed a union for good jobs and fair wages before we headed to Alaska Airlines HQ. We marched up and down Sea-Tac under the shadow of the control towers to confront Menzies and DGS. We weaved through a lifeless maze like office building to declare our intentions to GCA, up a hill to serve Bags and crossed an oddly elaborate cedar bridge to deliver our message to AirServ. When we finally arrived at Alaska Airlines we huddled close to the locked doors at Alaska Airlines. After a few minutes of ringing bells, knocking and chanting a representative of the airline came out to talk with us. Sylvan, another worker for a poverty-wage contractor, garbed in his work vest, held out the letter to the Alaska PR agent. The Alaska PR agent thanked us and took the letter before ducking back into the office. Workers at our airport are standing up for themselves. They work hard and deserve the respect and dignity that they show Alaska Airlines’ customers. 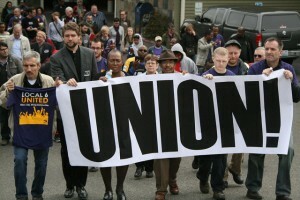 We’ll stand with them as they keep pushing for good jobs and fair wages.